For other subjects with similar names, see Wilshire. According to the city's official community plan, the Wilshire Community Plan Area (CPA), also known as the Wilshire District and sometimes as Mid-City, "is bounded by Melrose Avenue and Rosewood Avenue to the north; 18th Street, Venice Boulevard and Pico Boulevard to the south; Hoover Street to the east; and the Cities of West Hollywood and Beverly Hills to the west." The adjacent community plan areas are Hollywood to the north; South Central Los Angeles and West Adams–Leimert–Baldwin Hills to the south; Silver Lake–Echo Park and Westlake to the east; and West Los Angeles to the west. The Wilshire area includes the neighborhoods of (roughly from east to west) Wilshire Center, Koreatown (part of which extends outside the CPA), Windsor Square, Hancock Park, Larchmont, Mid-Wilshire, Mid-City, Miracle Mile, and Carthay. Within the Wilshire CPA, the neighborhood of Mid-Wilshire is bounded roughly by Crenshaw Boulevard, Pico Boulevard, Fairfax Avenue, and Wilshire Boulevard. Part of Miracle Mile overlaps with Mid-Wilshire. Map of Mid-Wilshire, Los Angeles. 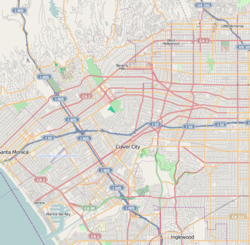 According to the Los Angeles Times Mapping L.A. project, Mid-Wilshire is bounded on the north by West Third Street, on the northeast by La Brea Avenue and Wilshire Boulevard, on the east by Crenshaw Boulevard, on the south by Pico Boulevard and on the west by Fairfax Avenue. Mid-Wilshire is flanked by Fairfax, Hancock Park and Windsor Square to the north, Koreatown, and Arlington Heights to the east, Mid-City to the south, and Mid-City West (Carthay and Beverly-Fairfax) to the west and northwest. Little Ethiopia is a block-long stretch of Fairfax Avenue between Olympic Boulevard and Whitworth Drive in Los Angeles, California. The area has a high concentration of Ethiopian restaurants, as well as a significant concentration of residents of Ethiopian and Eritrean ancestry. 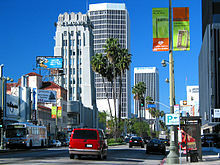 Miracle Mile is a 1.5-mile (2.4 km) stretch of Wilshire Boulevard between Fairfax and Highland Avenues. In the early 1920s, Wilshire Boulevard west of Western Avenue was an unpaved farm road, extending through dairy farms and bean fields. Developer A. W. Ross saw potential for the area and developed Wilshire as a commercial district to rival downtown Los Angeles. 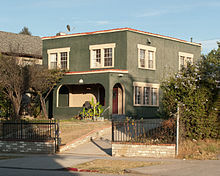 Oxford Square is an historic neighborhood  which, according to the Oxford Square Neighborhood Association, lies between Pico Boulevard and Olympic Boulevard and includes both sides of Victoria Avenue and South Windsor Boulevard. In 1910 the neighborhood was laid out between Wilshire Boulevard on the north and Pico Street on the south, west of the Los Angeles Country Club. It was served by the Pico Street streetcar line. The unimproved lots offered by developer Emil Firth ranged from 50 to 100 feet on the street and were 171 feet deep. The streets were 70 feet wide, with 15-foot sidewalks and parkways, which were to be planted with palm trees and flowers. Ornamental [Street light|[electroliers]] were to be placed every 300 feet. Lot prices ranged from $1,000 to $2,500. Earlier, in 1907. the Harriman interests had begun a four-track subway line across Oxford Square, south of Wilshire Boulevard. In 1991 the City Council approved a request by Oxford Square - Windsor Village residents to close 10th Street at Victoria Avenue in an effort to reduce crime in the communities after a recent outbreak of burglaries and robberies, as well as one homicide. In February 2015 the neighborhood association was lobbying to form an Historic Preservation Overlay Zone (HPOZ). That would have put a temporary moratorium on the issuance of city building and demolition permits. Los Angeles City Council approved the HPOZ, adopting its preservation plan effective March 26, 2017. Park La Brea is an apartment complex bounded by 3rd Street on the north, Cochran Avenue on the east, Sixth Street on the south and Fairfax Avenue on the west. With 4,255 units located in eighteen 13-story towers and 31 two-story "garden apartment buildings," it is the largest housing development in the United States west of the Mississippi River. Park Mile is a commercial strip that lies along Wilshire Boulevard between Highland Avenue on the west, Wilton Place on the east, Sixth Street on the north and Eighth Street on the south. Some of the office buildings in the district have been designed to harmonize with the nearby Hancock Park area, with long, horizontal warm look of brick and other textures rather than a vertical high-tech design. Construction is regulated by the Park Mile Ordinance, adopted by the city in 1979. It was designed to protect the single-family nature of the residential area and to promote development that provided Park Mile with an "image and sense of continuity." There is a three-story height limit along Park Mile, as well as a ban on painted signs on the outside of buildings. In 1990 a Park Mile-Wilshire District neighborhood design review board, composed of five to seven volunteers appointed by City Council members, was one of four such local boards throughout the city that oversaw architectural planning. Sycamore Square is a Mid-Wilshire neighborhood located between Hancock Park to the north, Miracle Mile to the west, and Brookside to the east. It is bordered by Wilshire Boulevard to the north, Olympic Boulevard to the south, La Brea Avenue to the west, and both sides of Citrus Avenue to the east. Wilshire Vista is an area north of Pico Boulevard near La Brea Avenue which for a long time was typically African-American but which around 2001 became more varied in ethnic composition with the arrival of young families and single professionals. A portion of Wilshire Vista was part of a 120-acre farm purchased in 1870 by Joseph Masselin, a French miner who had failed at prospecting in the 1849 California Gold Rush and then settled in the Los Angeles area in 1870. His heirs sold 73 acres fronting on Wilshire Boulevard to Walter G. McCarty, John A. Vaughn and John Evans, who combined it with other land to form the Wilshire Vista tract. Sales and development began in 1922 on 85 acres of high, rolling ground between Pico, Cahuenga and Wilshire boulevards, with "the promising of a [street]car line, the new Los Angeles High School within eight minutes walk, the Page Military Academy on the adjoining property, the convenience to the city and beaches via the boulevards, as well as Country Club Drive and San Vicente Boulevard running across the tract." The 2000 U.S. Census counted 41,683 residents in the 2.78-square-mile neighborhood—an average of 14,988 people per square mile, among the highest population densities for the city and the county. In 2008 the city estimated that the population had increased to 47,176. The median age for residents was 34, about the city's average. Mid-Wilshire was said to be "highly diverse" when compared to the city at large. The ethnic breakdown in 2000 was whites, 33.6%; blacks, 22.7%; Latinos, 19.9%; Asians, 19.8%; and others, 3.9%. Mexico (16.1%) and Korea (24%) were the most common places of birth for the 25.1% of the residents who were born abroad, a figure that was considered average for the city as a whole. Mid-Wilshire residents aged 25 and older holding a four-year degree amounted to 45.2% of the population in 2000, a high rate for both the city and the county. The percentage of residents with a master's degree was also high. The Wilshire Ebell Theater, Los Angeles Historic-Cultural Monument #250. Los Angeles County Museum of Art, the Page Museum, Hancock Park and the La Brea Tar Pits on the north side of Wilshire Boulevard between Fairfax and Curson avenues. The Miracle Mile, a commercial strip on Wilshire Boulevard east of Fairfax Avenue designed in the 1920s by developer A. W. Ross to attract and serve automobile traffic rather than pedestrian shoppers. Petersen Automotive Museum, on the southeast corner of Wilshire Boulevard and Fairfax Avenue. One of the world's largest automobile museums, the Petersen is a nonprofit organization specializing in automobile history and related educational programs. Olympia Medical Center, formerly Midway Hospital Medical Center, between Olympic and San Vicente boulevards. Harold A. Henry Park, named after the former city councilman, at Ninth Street and Plymouth Boulevard. Los Angeles High School Memorial Park, with its associated Memorial Library, dedicated to the L.A. High graduates who took part in World War I. It is on Olympic Boulevard between Mulllen and Muirfield avenues, facing Los Angeles High across the street. Queen Anne Recreation Center, at 12th Street and West Boulevard, with an auditorium, barbecue pits, baseball diamond (lighted), basketball courts (lighted/indoor, unlighted/outdoor), children's play area, picnic tables, restrooms and tennis courts (lighted). Town and Country shopping center, on the southeast corner of Third Street and Fairfax Avenue. ^ Levin, Rachel (2009-03-10). "NEIGHBORHOODS: Little Ethiopia". Los Angeles Times. ISSN 0458-3035. Retrieved 2018-02-16. ^ "Oxford Square preservation plan, published by the Los Angeles Office of Historic Resources" (PDF). ^ "Historic Preservation Overlay Zones (HPOZs) - Office of Historic Resources, City of Los Angeles". preservation.lacity.org. ^ "Sycamore Square Neighborhood Association". www.sycamoresquare.org. 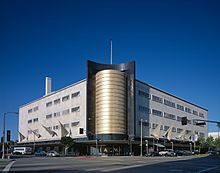 Wikimedia Commons has media related to Mid-Wilshire, Los Angeles. Seal, Kathy. "MID-WILSHIRE : Minorities' Private School Connection." Los Angeles Times. June 11, 1995. Doherty, Jake. "Lawmaker Opposes Site for School : Education: Density that would result from a Temple-Beaudry facility is 'not good planning,' Assemblyman Richard Polanco says." Los Angeles Times. January 16, 1994. Los Angeles City Park Mile ordinance.